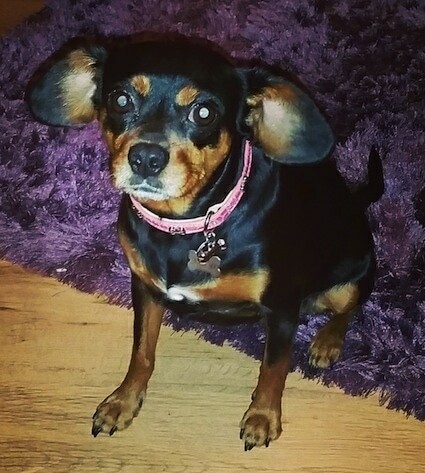 Millie the Cavalier King Charles Spaniel / Miniature Pinscher mix at 4 years old—"Millie seems to be a one of kind apart from her brothers and sisters, obviously. It was an accident that her mother got pregnant. She is very friendly and is a little scared of bigger dogs. I would love to know what people think of her as I like to call her a "King Pin" and if there are any other King Pins around?!" The King Pin is not a purebred dog. 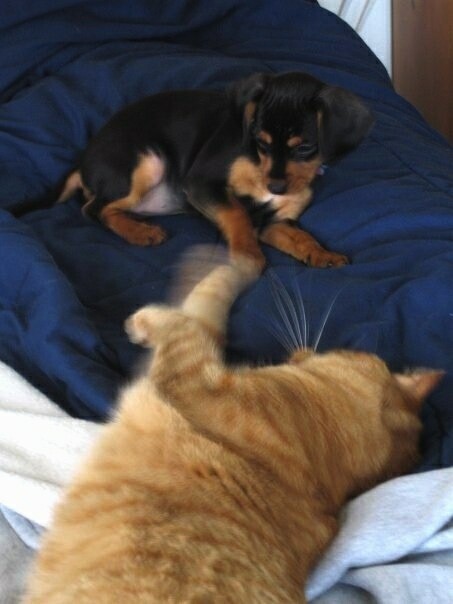 It is a cross between the Cavalier King Charles Spaniel and the Miniature Pinscher. The best way to determine the temperament of a mixed breed is to look up all breeds in the cross and know you can get any combination of any of the characteristics found in either breed. Not all of these designer hybrid dogs being bred are 50% purebred to 50% purebred. It is very common for breeders to breed multi-generation crosses. Chloe the King Pin at 11 months old—"I have the most beautiful dog in the world. My King Pin is a very energetic dog during the day, but when its time to lay down, Chloe comes right over to snuggle up. Chloe is so adorable but her attention span is very low. When I take her outside, she gets distracted easily. She hates to walk in wet grass as well (I dont know if thats a breed issue or not). Chloe is a quick learner. She adapts well to knew environments. One thing I have noticed is that Chloe is timid of males. ALL MALES!! I have not the slightest clue as to why that is but its absolutely true. BTW this is my first dog and I would not ever want to trade her for the world. 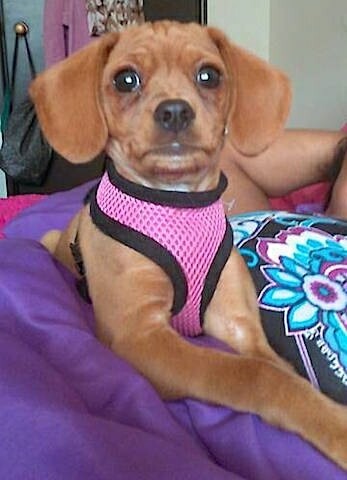 Millie the Cavalier King Charles Spaniel / Miniature Pinscher mix as a puppy. 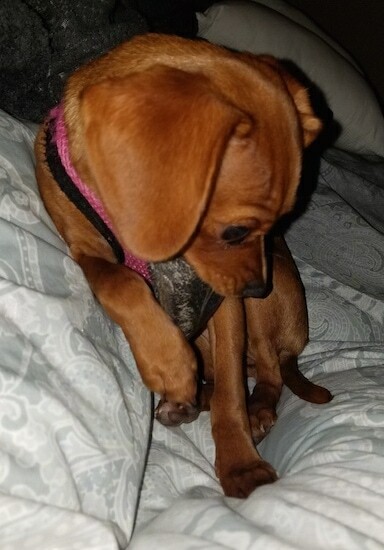 Betty the Cavalier King Charles Spaniel / Miniature Pinscher mix as a 6-month-old puppy hanging out with the cat—"She has the most charming qualities of both breeds! 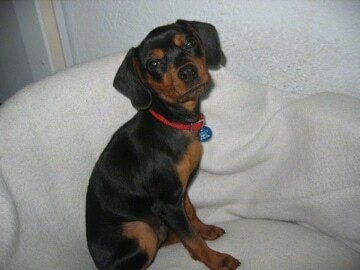 She weighed 8 lbs at 1 year old, and she has black, tan and white coloration. She is very lively and adventurous, and loves investigating everything around her. 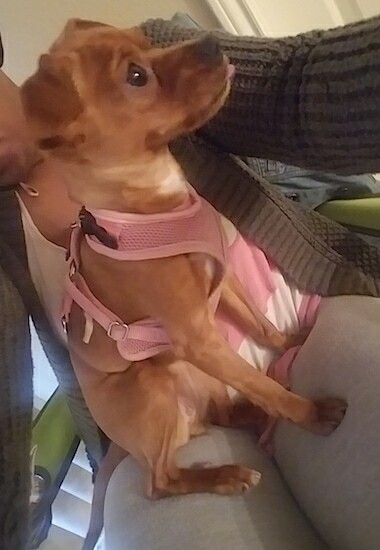 She isn't timid like many small dogs (under 10lbs especially!) She loves to cuddle up on a lap when she's finished with her adventures, and she adores hanging out with her animal "siblings" both dogs and a cat! Betty likes to rip things apart for whatever reason, but she loves being around people and animals and has a very VERY happy demeanor. She is the most spirited dog I have met!" 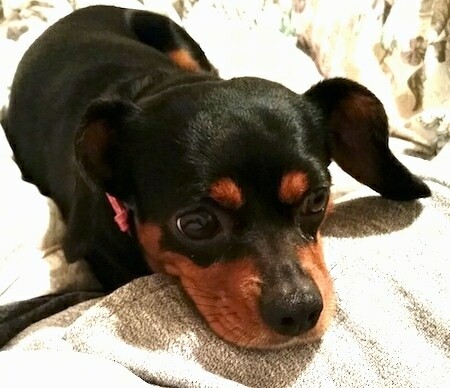 Cooper the Cavalier King Charles Spaniel / Miniature Pinscher mix as a puppy—"I have a mix between a Min Pin and a Cavalier King Charles. He is very playful, loves to cuddle, gets along well with other dogs and loves to hide underneath blankets. 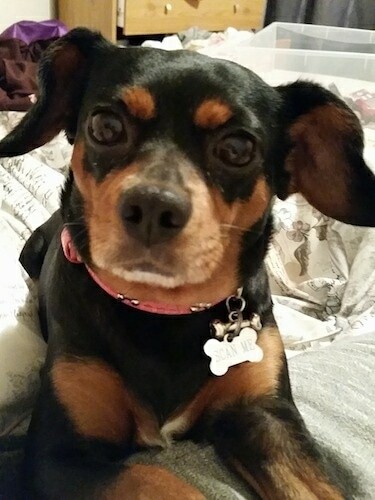 I have not found another mix breed like him and wanted to send in my picture to see if there are any other Mini Pincher / Cavalier mixes. As an adult he is at most 14 lbs and loves to be held."